When businesses hire their first team members, they often start without having considered all of the implications, which means they don’t have an employee manual in place. But, your new employee is going to be representing you and your company to your customers and clients. They will be at your premises and will gain access to all of your knowledge and resources. Many people find that what starts out with great promise ends up in disaster when they haven’t considered all of the potential scenarios. From the day your first team member walks in the door you also inherit a whole pile of legal obligations with which you must comply. 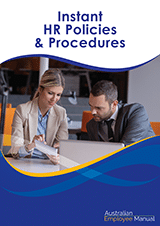 The majority of these legal obligations require you to document your policy on certain areas, and to educate your team members on these obligations. You need to ensure you have addressed all workplace health and safety, sexual harassment, bullying, racial vilification, anti-discrimination, and privacy requirements. You also need to comply with all industrial relations and financial obligations in terms of correct payments of wages and superannuation. 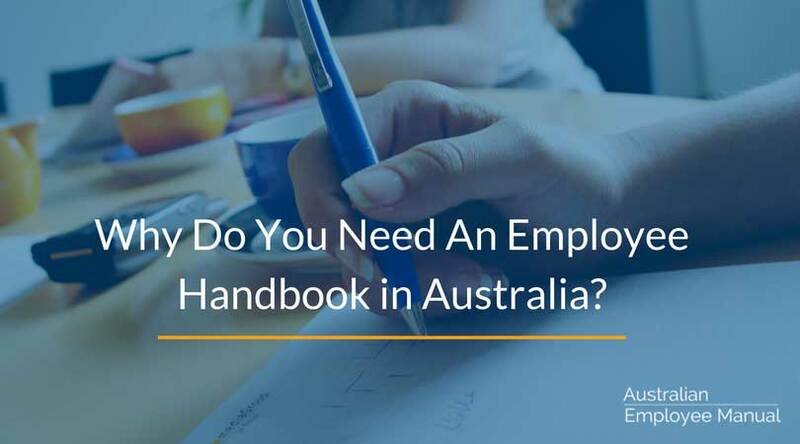 Just as you ensure that your ATO requirements are met for your financial obligations, you also need to meet all requirements under the raft of legislation that covers employees through having an effective employee handbook. Team members need to know their rights, responsibilities, and entitlements. By having them spelled out in your employee policy manual, you can quickly educate all your team members without having to go hunting for information. You can refer a team member to a particular employee policy if they have a question. Your time is precious. By writing down and sharing the information with your team members you save repeating yourself. You will also reduce new team member orientation time as everything is well documented and easy to follow. By documenting your employee policies, both you and your team members know the procedure you will be following for particular issues. This is vital for procedures such as employee reviews, probation and discipline processes. Your employee handbook needs to cover off all of the common questions that employees want to know about. It needs to say “this is how we do things around here” and set a firm line in the sand that shows boundaries. Position descriptions and job descriptions – what each role does. Recruitment and selection process – how you hire and reference check someone. New employee orientation and induction process – what process you will use to make sure new employees know what they are doing and the rules around their employment. Rules around any probationary period and how you will assess whether someone is permanently appointed. Hours of work and rosters – any rules you have about punctuality, changing rosters, public holidays, overtime, timesheets, friends and family visiting the workplace. Pay and personnel records – including paydays, payslip information. Any discounts on goods and services or other benefits you offer. Leave – annual, sick, maternity, paternity, adoption, long service, compassionate, study, jury service, ceremonial leave, leave without pay etc. Moonlighting – can they do other jobs? Termination of employment – what rules are there around resignation or being sacked, abandonment of employment, redundancy? Privacy, confidentiality and intellectual property. Appearance and standards of dress. Travel and expenses – if you need them to use their own transport for things or travel for their job what will you reimburse and how. Employee Performance Reviews – how you will conduct them. Learning and development – what training do you offer. Poor performance – what if they are not performing, what will you do? Behaviour – this is where you cover off anti-discrimination, workplace bullying and harassment, racial vilification, workplace health and safety. Code of conduct – what minimum standards of conduct do you require. Discipline and termination – what will you do if someone “crosses the line”? What is your termination process? Grievance procedures – how an employee with a problem about a manager or other team member can go about getting it resolved. Administration things such as certificates of service, phone procedures, office appearance, cars, equipment, meeting rooms, dealing with customer complaints or aggressive customers. IT – use of computers, social media use, mobile phones and personal calls. You will need to have some way of controlling the versions of the manual as things will change. The simplest way is to keep your document as an electronic version on some form of an intranet that way everyone always has the current version of the employee manual. If you decide to keep it paper based in a folder, keep version control as a simple note in the header or footer and reissue the whole section rather than create a huge song and dance with sheets that say take this out and put this bit back. You want things to be easy not hard to do! You do need to keep one central file of every document and every change and the dates of these changes. I have seen too many cases before the courts where a policy was changed but because the company couldn’t produce evidence of the date of the change they lost the case.